For the fourth consecutive year, the World Poker Tour will host a WPT500 event at Aria in Las Vegas. But before the standard stop for the WPT500 Las Vegas at Aria, the tour will make its first stop in California. The WPT500 Los Angeles will take place at Gardens Casino. Here’s a look at what players can expect at both of these stops. The WPT500 Los Angeles will act as a lead-in to the World Series of Poker. It takes place from May 21-31, 2017, at Gardens Casino just outside Los Angeles; the WSOP gets underway on May 31. The WPT500 Los Angeles tournament features a $1 million guaranteed prize pool. It will cap off a larger tournament series, the Gardens Poker Festival, which begins on May 15. As with all WPT500 stops, the buy-in will be $565. The tournament will feature multiple starting flights, 14 to be specific. From May 21-24, there will be one starting flight per day, at 11 a.m. From May 25-29, there will be two starting flights per day. There will be a standard format at 11 a.m. and a turbo format at 5 p.m.
“The World Poker Tour couldn’t be happier to partner with The Gardens Casino to bring the WPT500 to California for the very first time. 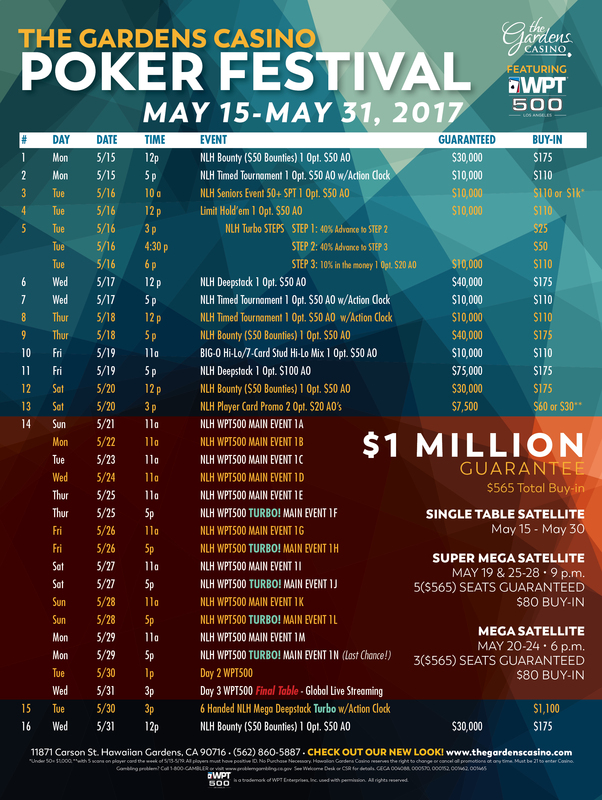 The WPT500 is a tremendous addition to the state’s robust and vibrant poker landscape, and Memorial Day Weekend in Los Angeles is the perfect time and place to host this historic event. Re-entries will be permitted. The event will use the “best stack forward” format. Players who enter for multiple starting flights and make Day 2 take only their best stack forward. They forfeit all other chip stacks. Another interesting wrinkle the WPT has added for the event is the use of the Action Clock by Protection Poker. But the clock won’t be in use throughout the tournament. Once the field is reduced to 54 players (sometime on Day 2), the Action Clock will come into play. Since its inception, the WPT500 Las Vegas has taken place at the height of the WSOP, just before the Main Event. It offers players a lower-cost option, or a second chance after busting out of a WSOP tournament. With the entire poker community in Sin City, the WPT500 Las Vegas is among the best-attended tournaments of the year. This year’s WPT500 Las Vegas will commence on June 26 and run through July 5. Aria will play host to the tournament. Like the WPT500 Los Angeles, it is a $565 buy-in and features a $1 million guarantee. The WPT500 Las Vegas will have nine starting flights. There will be one per day from June 26 through July 2 at 11 a.m. The final two starting flights will begin on July 3. There will be a standard flight at 11 a.m. and a turbo flight at 5 p.m.
“There are very few tournaments in the world at WPT500’s price point which allow players the chance to win hundreds of thousands of dollars in prize money. Together with ARIA, in its first three years WPT500 Las Vegas has awarded more than $6.3 million and generated nearly 13,000 entries. The WPT500 Las Vegas will also use the “best stack forward” format. It will not feature the Action Clock for days two and three, however. Steve Ruddock is an avid poker player and a veteran member of the gaming media. His primary focus is on the regulated US online casino and poker markets. He writes for numerous online and print publications, including OnlinePokerReport.com, USPoker.com, and USA Today.